Pier A, at the northern edge of Battery Park, in Lower Manhattan. Photo: CityLand. Commissioners praised overall plan for long-dormant and dilapidated landmarked building, but requested modifications to its paint scheme. On February 16, 2010, Landmarks approved changes to a renovation plan for Pier A, an individual City landmark in Lower Manhattan’s Battery Park. In 1992, Landmarks issued a report approving Pier A’s renovation and adaptive reuse. The new plan included changes to the proposed paint scheme and to the doors and windows. 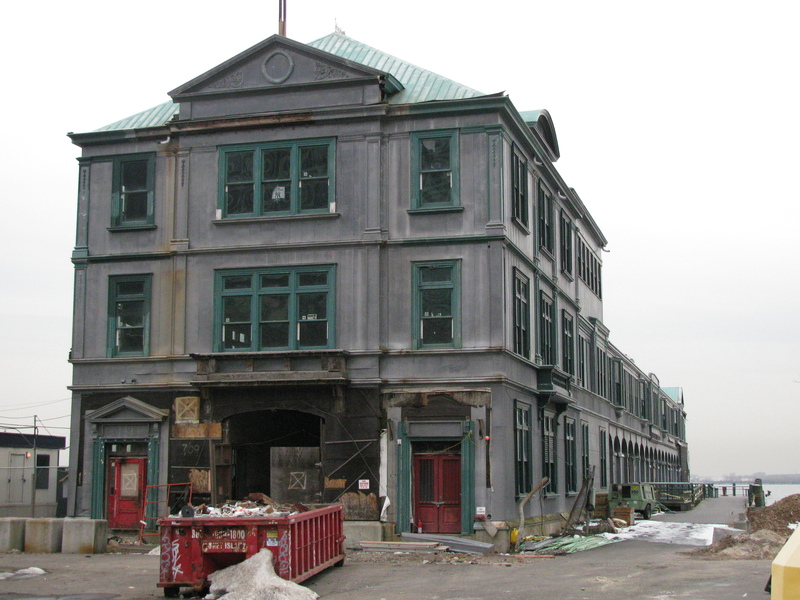 The three-story, Beaux-Arts style Pier A building was completed in 1886 and served as headquarters for the City’s Department of Docks, the NYPD’s Harbor Precinct, and the FDNY’s Marine Division, but has remained vacant since 1993. The Battery Park City Promenade, built by the City in the 1990s, surrounds the building on three sides. The Battery Park City Authority is funding the renovation project. Hugh Hardy of H3 Hardy Collaboration Architecture said the project is not strictly a restoration, but rather an interpretation intended to be a “layering of our own use on top of others.” Jack Martin, H3’s project manager, said the building is currently leaning “a couple of degrees” to the south and that the pier’s superstructure is being upgraded to hold up the leaning structure. Pier A’s internal floor and shell components will also be upgraded to allow for maximum flexibility of use. Martin noted that the building’s future use had not been determined, but pointed out that the Authority had recently issued a Request for Qualifications. H3 architect Jason Van Nest presented the proposed paint scheme. Van Nest explained that while the building historically had a darker trim than its base, the trim was lost by the shadow cast by the building. To mitigate this problem, the proposal included using a lighter trim that would illuminate the building’s details. The roof would be painted pale green to evoke the color of aged copper. Van Nest said the other modifications to the structure’s exterior included adding a new staircase, extending entrance ramps, and installing new windows. Commissioner Fred Bland expressed support for the overall project, but questioned the use of the light trim. Commissioner Stephen Byrns also found the lighter trim too contemporary, and he suggested that a darker trim would be more authentic. Vice Chair Pablo Vengoechea called the proposal “remarkable,” but wanted to see paint samples before voting. The architects returned later that day with renderings depicting a trim darker than the base color and paint samples. The Commissioners voted unanimously to approve the modified certificate of appropriateness. LPC: Pier A, Manhattan (10-5626) (Feb. 16, 2009) (Architects: H3 Hardy Collaboration Architecture).